As happens so often in our home, we interrupted this month’s carefully planned lessons for a rabbit trail. This one was HUGE, all encompassing, and (assuming everything takes root) will live for years in our hearts and our yard. We planted gardens. We approached this otherwise humble task in my usual, somewhat overzealous way. We looked at the plot in the backyard and then at the sides of the house and then at the front of the house and decided it all must be planted. So, after consulting and virtually consuming all the gardening resources listed in the “Garden Inspiration” sidebar and drilling my friends at 4Real, we imported forty cubic yards of dirt and compost and other assorted layering material. These regularly delivered piles of dirt effectively pulled us from the table in the learning room, out of doors. And the education my husband and I were getting naturally spilled over and thoroughly drenched the children. Time to bring in the books! The first bunch of books was emergency ordered: Nicholas was suddenly terrified of bugs—bees in particular—and boycotting the entire endeavor. He refused to come inside. So we began with The Bee Tree, Patricia Polacco’s tale of a child’s and her gandfather’s raucous romp through the village, gathering friends and neighbors, while they chased a bee in search of a whole tree full of bees. Surely, these critters were not to be feared if some people actually go off looking for them. We examined a honeycomb and made buttermilk biscuits and honey for tea time. After The Bee Tree, Dad sat and read The Magic School Bus Inside a Beehive. There’s nothing like facts, endearingly presented, to disarm the fear and equip a boy with the power of knowledge! We drew some bees for nature journals and talked the poor creatures to death. Finally, on an absolutely perfect spring day, Nicholas could no longer resist the draw of that huge pile of dirt—he had to get outside and play, bees or no bees. Now, our reading could turn to the gardens themselves. No garden trail is complete without The Secret Garden. We listened to the audio version in the car last week. Now, we’re poking our way through Inside the Secret Garden,which is just crammed full of more information about the beloved book. 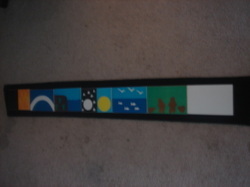 We’re sneaking just a little history and geography into an otherwise nature-oriented study. Also, there are some must eat recipes (don’t the descriptions of Dickon’s mother’s cooking make you want to eat? ), and some crafts we’ll try just as soon as it rains and we come inside. I’m particularly looking forward to making plant markers with stones and a gardening tool rack out of a sturdy twig. We began our planting with the vegetable garden, so our reading began there, too. Lois Ehlert’s Growing Vegetable Soup tells the story of planting and growing a garden which will yield “the best soup ever.” This is a very simple book with clean, bold graphics. It is at once garden inspiration and reading practice for my beginners. There is even a recipe to try once the young gardener’s kitchen garden begins to yield its bounty. From there, I couldn’t resist Fanny at Chez Panisse, a book for longer attention spans and grwoing vegetable cooks. How can we talk about kitchen gardens without talking about Alice Walters, founder of Chez Panisse, the ultimate vegetable garden restaurant? This book tells the story of Fanny, Alice’s daughter, who grew up in the restaurant. Once the veggies were safely in the ground, we moved on to the strawberry patch. We planted the strawberries and then we rimmed the garden with sunflower seeds and marigolds. To truly appreciate what we’d done, we had to first understand a little about seeds. Gail Gibbon’s science picture books are always winners, never dumbed-down and containing more than enough information to cover the material as well as most middle school science books;they are accessible to all my children. We read From Seed to Plant and then Eric Carle’s endearing The Tiny Seed and then we consulted the ultimate authority, Miss Frizzle and the Magic Schoolbus. Now, the children were all eagerly anticipating watching tiny sprouts spring from the ground. From knowledge gained in these books, they were able to closely examine seeds and to draw and label seed and plant parts for their nature notebooks. Stephen was a bit troubled by the seed to plant lifecycle. How did the first plants grow? Where did the first seeds come from? Which came first the chicken or the egg? We took a quick trip to the atrium to present a lesson on Creation. But what would we truly have when we had sunflowers? We would have the lovely, gigantic flowers that make Eve Bunting’s Sunflower Houses. Their story is told in rhythmic rhyme with bright pictures and a joyful celebration of the lifecycle of the sunflower seed. Sunflower Sal is a girl after my own heart: she simply can't sew (yet) and so she sets out to plant a quilt. Her arrangement of sunflowers around the beds yields a living quilt that is lovely to behold. Finally, one cannot think of lovely sunflowers without thinking of Van Gogh. Laurence Anholt’s Camille and the Sunflowers takes us to the world of a little boy named Camille who lived “where the sunflowers grew so high they looked like real suns—a whole field of burning yellow suns.” Vincent Van Gogh lived in Camille’s world too and the story tells of what happens when they encounter each other. Stephen was taken with this book and when he recognized some of the pictures in the book, he dug up our picture study prints. 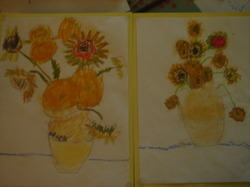 He and Nicholas worked on sunflower masterpieces of their won. Glimpses of Van Gogh masterpieces will surely inspire dragging the easel out to the garden as soon as our sunflowers bloom. Next to the strawberry patch, we’ve planted an herb garden that flows into a flower bed. Why, we found ourselves Planting a Rainbow! There is an abundance of flower names in this simple bold book, with each variety color-coded and clearly labeled. 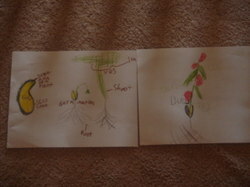 As simple as those pictures are, they are far more complex in Jack's Garden. This darling story builds on itself, modeled after “The House the Jack Built.” It’s crammed full of well-labeled flower varieties and birds and insects which accompany a truly engaging, rollicking text. No garden study is complete without some attention to the butterflies. In Waiting for Wings by Lois Ehlert, we discovered a slightly more sophisticated layered book than the perennial favorite The Very Hungry Caterpillar. Waiting for Wings tells of the caterpillars’ transformation and then the butterflies’ flight to a waiting garden. There, we learn a little about butterfly behavior, all on bold, splashy pages. That is followed by butterfly identification pages, butterfly information pages, and very general directions for our next project: planting a butterfly garden. From the boldness of Ehlert’s book, we moved to the lyrical language of Joanne Ryder and the detailed brilliance of Lynne Cherry in Where Butterflies Grow. This book tells the story of the caterpillar and butterfly again and then gives some more specifics on butterfly gardens and the behavior of butterflies in those gardens. I’m a big fan of the author/illustrator combination and this book didn’t disappoint me. Nicholas, on the other hand, commented on page 2 that he, “already knows what’s going to happen. That caterpillar is going to turn into a butterfly.” Okay, so it is a familiar plot. 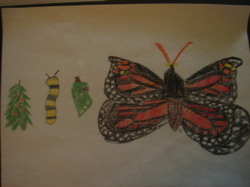 We drew the lifecycle of the butterfly and researched what plants we could plant to attract butterflies in our garden. We’re still watching for butterflies we can photograph and observe in real life. From the butterflies, I took a very natural diversion to a much less traveled path. What is a garden without fairies, at least the fairies of our imaginations? Fairy Flight poses the question: Are butterflies really fairies in disguise? My two littlest children are truly still wrestling with this. I've never wished I'd vidoeotaped storytime so much as when I introduced this book and Fairy Houses. The latter book reads like a very happy dream, complete with instructions on how to make fairy houses. My children could hardly sleep in anticipation of giving it a try. And when the dream is over, what fun it is to awaken to Fairies: Petal People You Make Yourself , another of the great Klutz craft books. Therein is the perfect craft for a rainy day that keeps us inside. This is one unit that was very light on crafts or planned activities for paper and pencil. Most of learning has taken place outside in the dirt. We’ve talked about the grownup gardening books and the information they contained, planned together and worked really hard at making our vision a reality. All of our garden activities are being chronicled on our online nature journal, Blossoms and Bees. 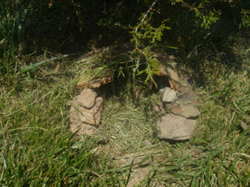 The children and I have recorded our outdoor adventures, along with photos and poetry. It's an ongoing project, for as long as they and the plants keep growing! Please drop by and visit our yard and let us know you came. For my children, blogging is a new medium, a new way to express themselves and a very rewarding way for to publish their work almost instantly. They are able to keep meticulous records of what we’ve planted and how to care for it. Our success and failures will be there for us to consult later and for the whole world to see. Considering I had no formal language arts lessons planned, a whole lot of copy work was done in the midst of our gardening and much was learned about the publishing process. From a mound of dirt, to bountiful, beautiful banners in our yard, this is a rabbit trail that will truly live forever in their memories and their futures. Note that all the books are pictured and linked on the sidebar in the Rabbit Trail Basket.